Step into the all new F-35 Lightning FC - Furious FPV's 1st dedicated wing flight controller, ready and waiting to open all new worlds to winged FPV. Encompassed by a robust case for maximum levels of protection and strength, the F-35 FC offers the ultimate levels of FPV capability that is dedicated & purpose built for the demands and capabilities of FPV winged flight. Crossfire RX, RX, Bluetooth functionality. With these systems in play, the F-35 offers worlds of capability & performance for maximum levels of FPV flight. Integrating a built in 5V@3A BEC, buzzer port, anti vibration silicone dampeners and battery monitor with current sensor, the F-35 Lightning FC packs a massive punch in an ultra compact form. Pair this with a built in Barometer & OSD system, the F-35 FC is the game changing flight controller that is ready for anything and everything a pilot could possibly desire. 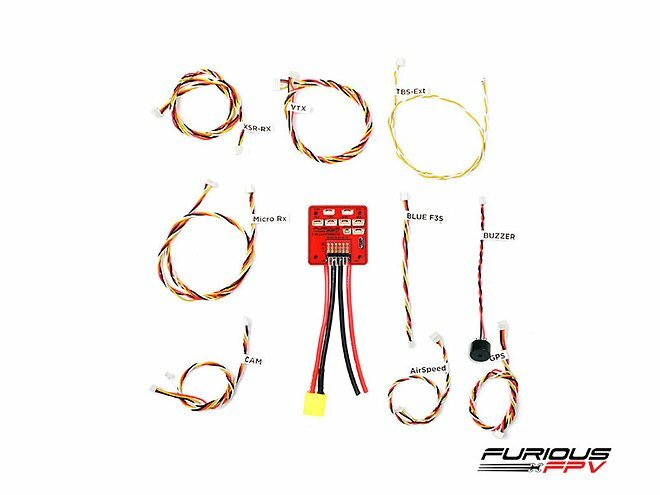 Take your winged FPV flight to new worlds and beyond with the Furious FPV F-35 Lightning FC - the ultimate winged FPV flight control system. Alle Kabel dabei. Gefällt mir sehr gut. Service von FPV24 super. Im zweiten Anlauf habe ich dann doch ein FC bekommen bei dem der Gyro nicht defekt war. Wenn man im Netz recherchiert Die Qualitätskontrolle bei Furious öfters zu schlafen. Wohl dem der in Deutschland gekauft hat und nicht beim Chinamann, so das Problem schnell und unbürokratisch gelöst. Ich bin zufrieden, danke.